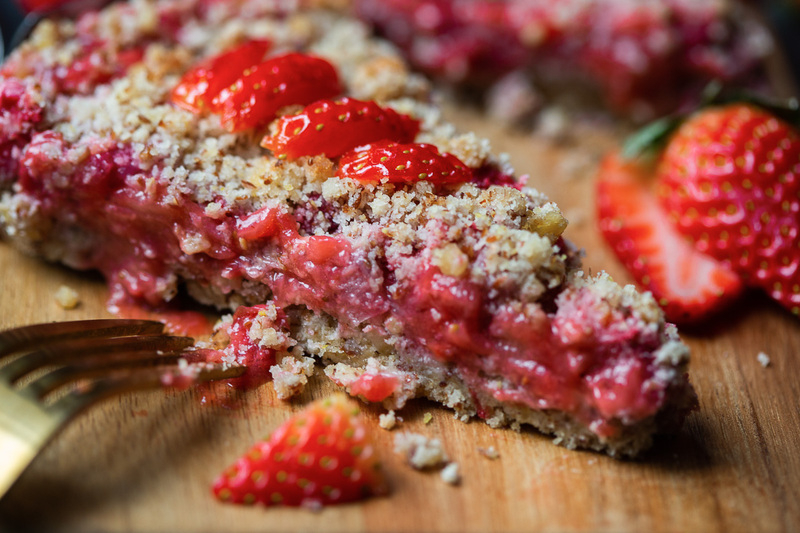 Right now I’m working on a cookbook, and I considered keeping this Keto Strawberry Rhubarb Crumble recipe a secret when I was first experimenting. But once it came out, and knowing it’s just about strawberry and rhubarb season, I couldn’t keep it to myself. So consider it a sneak peek of what’s to come! 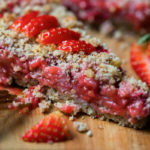 I made this Keto Strawberry Rhubarb Crumble recipe without almond flour because my dad is allergic to almonds and he was coming to visit, but it’s possible you could get a similar pie with almond flour. However, both coconut flour and flax are dry flours and tend to absorb moisture, which is something this pie needs because it’s full of juicy strawberries! 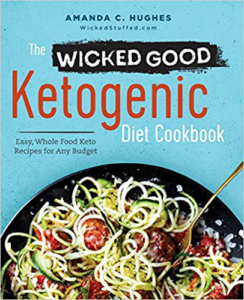 For that reason, I also consider the xanthan gum a total necessity because it keeps the filling together in an almost jelly-like way, you can find it next to the coconut flour in your grocery store. I hope you enjoy this dessert, my whole household and family loved it! Recipe Tip: Nuts brown quickly, so if you don’t cover the pie while baking, the crumble will brown and begin to burn. The pie needs some time to cook due to the rhubarb, so you don’t want them to brown or burn too early. 1-2 tsp Steviva Blend (or your favorite stevia/erythritol baking blend) I used 1 tsp, but some people love a really sweet pie, in which case, use 2. In a bowl, combine filling ingredients. Xanthan gum should be lightly sprinkled while mixing so that it’s evenly spread and doesn’t clump. Set bowl aside. In another bowl, combine walnuts, coconut flour, flaxseed meal, 1/4 cup sweetener, sea salt and toss together so it mixes evenly. Add butter and combine until the whole mix is crumbly. Set 1/2 cup of the crumble aside and the final another 1 tsp sweetener to it. Grease a 9″ glass pie dish with butter, then press down the bowl of crumble. Use your hands to press it flat into the bottom. Pour the fruit mixture over the crust and spread evenly. Finally, sprinkle the remaining 1/2 cup of crumble over the pie. Bake for about 20 minutes covered with tinfoil, then a final 10-20 minutes until crumble is browned (this will prevent burning the crumble because this dish needs a little time to cook). Once finished, let cool completely in the refrigerator (at least a few hours to set so it can be sliced and held like a pie), then serve. I hope you enjoy this Strawberry Rhubarb Crumble, my whole household and family loved it! 1–2 tsp Steviva Blend (or your favorite stevia/erythritol baking blend) I used 1 tsp, but some people love a really sweet pie, in which case, use 2. Nuts brown quickly, so if you don’t cover the pie while baking, the crumble will brown and begin to burn. The pie needs some time to cook due to the rhubarb, so you don’t want them to brown or burn too early. If you love strawberries then you’ll love my Berry Good Cream Cheese Ambrosia recipe. Try it out and let me know what you think in the comments. Can I use stevia by itself and not a stevia blend? Or how will a stevia blend work better than just plain stevia? thank you! Sorry, the blend is important for volume. You’d only be able to use a pinch of stevia, and it would also likely be bitter. I highly recommend finding a blend that’s stevia/erythritol based (not Truvia since that has sugar in it). I’m so excited that I found your blog today! SO many great ideas!! 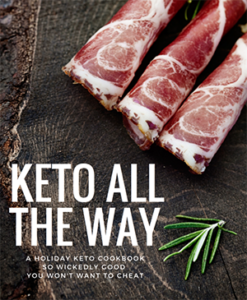 hi, i didn’t know rhubarb was keto? Yup, 1 cup is 3.8 net carbs. As comparison, strawberries are 9 for a cup. Wow, I just published some low-carb Vanilla Protein Blackberry Crumble bars, great minds think alike: http://freshplanetflavor.com/vanilla-protein-blackberry-crumble-bars/. I also commend your listing of berry carb counts in your email… I think lots of people assume blueberries are the most low-carb, for some reason! Do you think there is anything that could substitute for rhubarb? It is not available here. 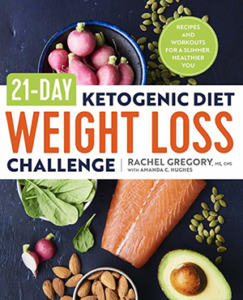 I made this the other day for myself (I’ve been doing keto since May) and figured it would last me for the week +. Turns out my husband really liked it too and was “helping” me eat it. It was delicious!! I have a low tolerance to the “fake” sugar substitutes, so I lessened the amt used, but was still quite impressed. Will definitely make again, maybe throwing some cinnamon and nutmeg in too. I fed this to company and it was a big hit! I followed this recipe exactly, and I am an experienced cook. It was dry and crumbly with very little fruit to crumble ratio. The rhubarb was also not cooked through. Was I supposed to precook the fruit? I think I would double the fruit mixture, and add more butter to the crumble. I liked it when you used xanthan gum instead of coconut flour. I will surely try this recipe for my family. Wow! 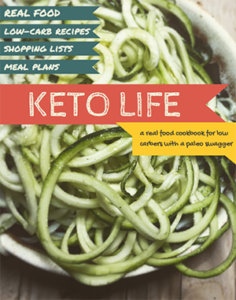 I rarely find dessert recipes that are perfect for ketogenic diet. This looks so tempting yet healthy. I’m sure my friends will love this one. Nice, I really love strawberries and its great to hear that there are recipes that includes in it. I made this and the only changes that were to added a little cinnamon to the crumble/crust and used golden lankato monfruit sweetener instead of stevia as I hate the flavor of stevia and it came out perfect. Wow, this recipe will be totally delicious. It has protein in it and I will definitely make this in the weekends.